This year has been a hot one, and it is probably even hotter for you if you’re currently suffering from sunburn. 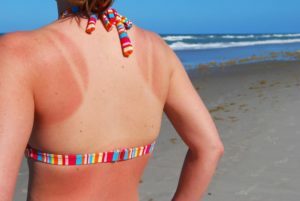 Whether you’ve fallen asleep on the beach, forgotten to reapply sunscreen because you were having too much fun surfing, or simply missed a spot, sunburn is no joke. It’s painful, itchy, and the redness will have you cringing at all of those vacation selfies. Keep reading to find some easy DIY sunburn remedies to help your skin recover. Keep your skin functioning properly and help it recover better. Staying hydrated is key to helping your skin work through the burn and come out on the other side happy and healthy. Drink as much water as you can, and try to cut down on alcohol, salt, and other dehydrating factors. Your skin will thank you. Having trouble falling asleep because of the pain? Pick up some aloe vera to help your skin heal faster and cut the burn. Aloe is a great option because it’s inexpensive, easy to find most places, and works like a charm. Find a bottle of aloe vera gel or even a fresh aloe vera leaf (sold in some health food stores) to help your skin feel better. Witch Hazel is an amazing powerhouse when it comes to helping you heal. It can be used to help swelling, bruising, and it even helps to balance your skin’s pH after you use your daily cleanser. Saturate a cotton pad with some witch hazel, slide it over your burn, and let it dry. Witch hazel may help your sunburn heal faster, and might even help you forgo that awful itchy peeling phase. Sunburn is always best treated by avoiding it altogether, especially since serious sunburns can increase your risk of developing Melanoma in later years. Use sunscreen, reapply it throughout the day, and wear protective clothing like long sleeves, hats, and sunglasses. If you want to learn more about your skin’s health, or are looking for a skin cancer check, please call us today at (650) 285-4661 to schedule a consultation.